Treatment may improve other medical problems linked to sleep apnea, such as high blood pressure. Treatment also can reduce your risk for heart disease, stroke, and diabetes. If you continue to have daytime sleepiness despite treatment it’s important to ensure that you are getting enough sleep; adults should get at least 7 to 8 hours of sleep; children and teens need more. Who has prescribed you the CPAP; is the person a qualified sleep physician who has personally looked at your sleep study raw data to make that judgment. Unfortunately this is often not the case in the subcontinent where HME providers in order to push the sales are doing sleep tests and giving out invalidated reports. As an empowered patient you should understand what’s in your best interest. 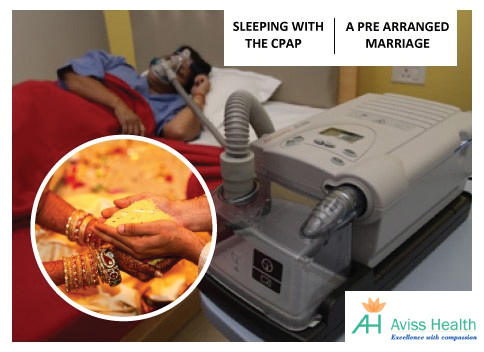 Do you understand the need of CPAP- like any chronic disease management you need to have insight about the disease, the implications of non-treatment and mechanism of action of the therapy? This is a critical part of your physician’s job which impacts the success of the therapy. Have you had a successful CPAP titration study; this helps the physician understand your pressure requirements and which machine shall best suit you. Different physicians/sleep services will use different pathways in lab/at home for doing this. This is followed by few days of trail of CPAP so that you can become accustomed to using this every night. Are you satisfied by your mask- Most Titration studies and /or CPAP trials shall give you the opportunity to try a few of these to see with which you are most comfortable. The step is the key to success of this therapy. Do you understand how to operate the CPAP-it’s important for you to understand some of the basic operations; most HME suppliers will be happy to demonstrate the same for you. Have you considered the need of accessories- most important being that of a humidifier; many machines come with inbuilt humidifiers with others it can be easily added. The other accessory to think about is the battery backup especially in the subcontinent where electricity is often erratic. Have you been explained about other potential problems- these could be eye problems because of leak, nasal bridge ulceration due to pressure, aerophagia etc. Do you have a follow up plan- No prescription is complete one; you must work one out with your physician.